The business, established in 1990, specializes in the repair and restoration of traditional timber leisure craft, both sailing and motorized. Many small craft (under 30' LOA) have been constructed using timber, plywood and modern adhesive technology. The business operates from Paynesville, which continues to be promoted as the Victorian Riviera, a burgeoning leisure boat center situated at the heart of the Gippsland Lakes, Victoria. The business premises are ideally sited in the marine industrial area of Paynesville opposite the Gippsland Ports Slipway and within easy access of boat ramps, jetties and marina berths and consists of a large purpose built shed which can accommodate craft of maximum length 15m and maximum height 4.2m. The building contains timber working machinery and good bench space. A landscaped and graveled boat and car parking area is provided at the front of the building. Overall the premises provide a pleasant and efficient work area for the dedicated and passionate team. Frecheville Heaney Boatbuilders is a proven successful small boatbuilding, restoration and repair business. They have a large share of the local boat repair, maintenance and restoration market. 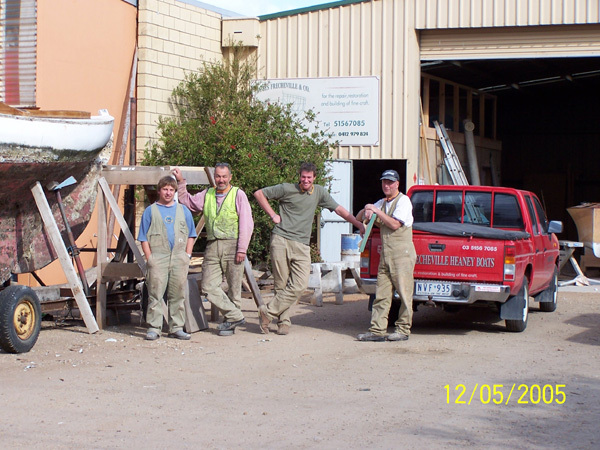 Their enthusiasm and energy in promoting the business statewide and nationally has resulted in increased restoration and boat building projects from beyond Gippsland. After extensive experience in the field of mahogany runabout restoration the company is now building reproduction timber speedboats to classic designs for discerning clients. The use of modern wood epoxy technology and coatings to build a more durable boat requiring less maintenance is encouraging enthusiasts to move from fiberglass to timber craft, especially where classic boating is concerned. Visitors are always welcome at our ever changing yet permanent wooden boat show, especially if they arrive with a packet of chocolate biscuits at morning tea time.